SAP Hybris Cloud for Customer is close to release its November 2017(1711) version. Please find below a visual timeline for the release and upgrade. We will host a pre-release webinar on September 28, 2017. Please find below the date-time and conference details for the webinars. I think there is typo error in the webinar details. I think it should be 1711 rather 1708. Do you have any available documents now on 1711? Likewise do you have links to the webinars that were conducted yesterday ? The documents will be published around the 18th of October. The webinar recordings should be up in a day or two. The team is working on making it available asap. Namita Roy, Can you please tag Andrew when the webinar links are updated? do you have an update on that? 18th Oct is much too late as release weekend is already on 21th (test). The previous releases it was published latest one week after the webex. Thanks. Do you know how many hours aproximely take the upgrade process and if there is any workaround to this downtimes for Customers with 24/7 services? Sebastine Augustine Namita Roy, , can you help? While the contractual upgrade downtime window for 1708 was 24hrs, the actual upgrade time was much lower than that for most customers. We are continuously trying to reduce the requested downtime window and you will hear more about it from us in the near future. Could you please provide a link to the recordings for the November 2017 release? We will be uploading them soon. Please bear with us. As the timeline,we have seen the 1711 cloud drop for all Test tenant. 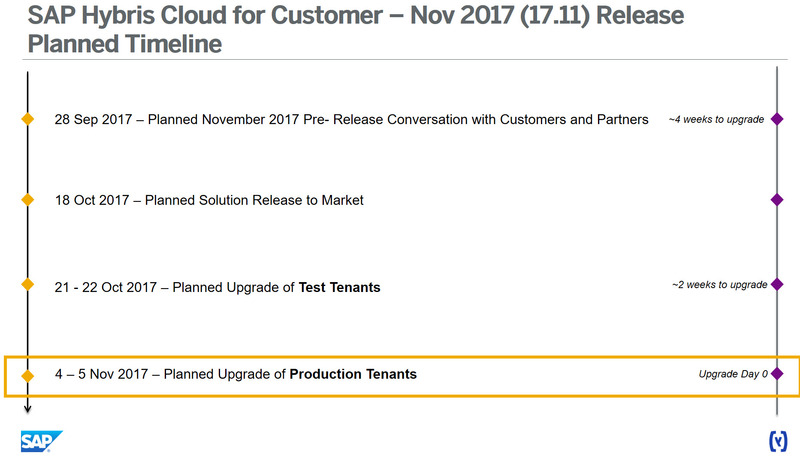 However Reference tenant are not upgrades till now? Is there any specific reason behind this or? When do we get more information around Feb 2018 Release for C4C? if you have already attended the webinar and are looking for more info, please wait till Feb 2 when we release our What’s New documents on the Help Portal.